I have been insisting, in numerous posts of mine, to reach out, if ever you have depressive or anxiety-driven thoughts. It is completely okay to feel sad in life. But being depressed, overwhelmed or anxious over a long period of time is not okay. Sometimes, it so happens that a depressed mind is not able to diagnose its state and suffers in silence. That is definitely not okay. There are many ways to identify if your mental health is in place or not. 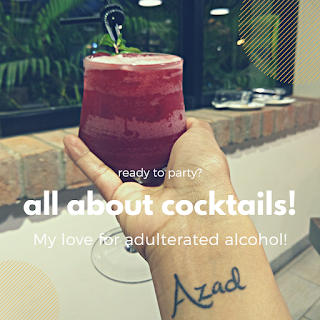 And I am sure if you have stumbled upon this blog post, you must have been doing a good amount of research on it already - which is good! I will again insist, please reach out if ever you feel in a way which doesn't seem right or normal. No matter how difficult it seems to push yourself to go and take professional help - you have to take that step for your sake. There are two things that I am going to talk about in this post. 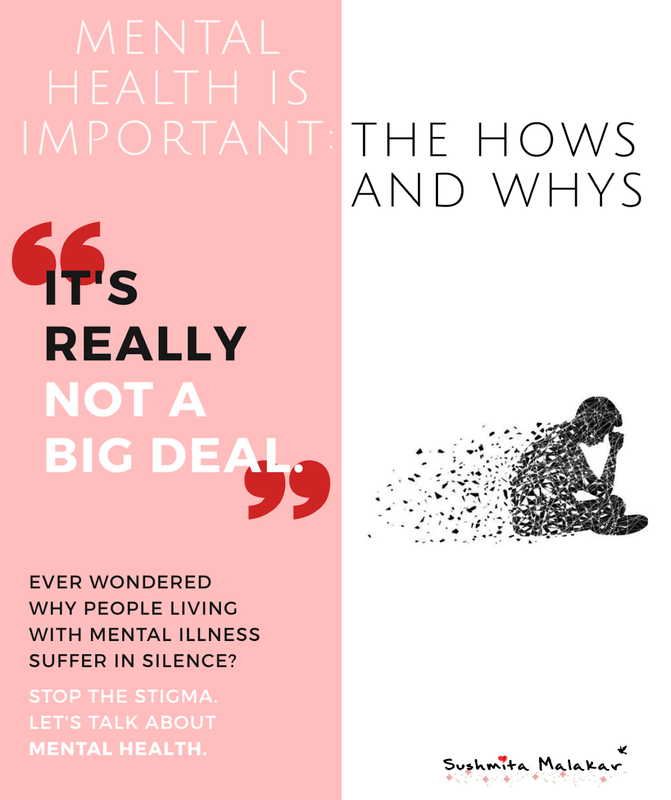 One, why your mental health is as important as your physical health. 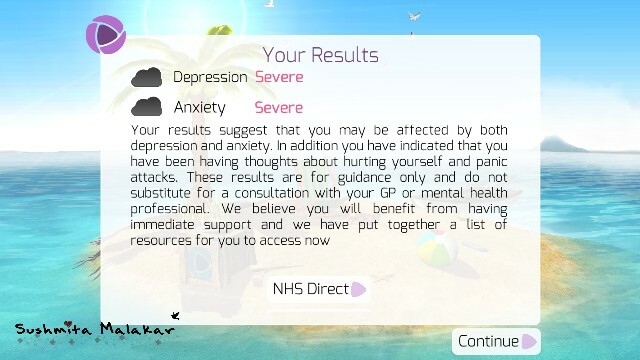 Two, how you can come to terms with the fact that you need professional attention simply by using this wonderful app called Thrive, created by medical professionals. So this is going to be a long post. But hold on, I am sure you will feel a li'l better by the end of it! Yes, that is a sad scene. We all are surrounded by those sh*tholes in our lives who brush off depression (or anxiety) as nothing. By no means, I am saying that everyone should experience this to be able to understand someone. All I want to say is that be li'l more human towards people! And I am sure that is one of the major reasons why someone suffering from any mental health disorder finds it difficult to come out and reach out for help. They tried reaching out, they are ridiculed and the story ends. My advice is - don't give up. Seek professional help. Even if your sh*thole friends are right, at least someone who is more capable and qualified enough of proving it will do that for you! Anxiety is closely related to depression. You tend to feel extremely negative about situations. You worry unnecessarily. So much so that it interferes with anything that you wish to do. You fear. Fear for life - and that is exactly the reason why I have given up driving. I just fear that I might die any moment if I take on the wheels. And that is the story of how I lost my independence. 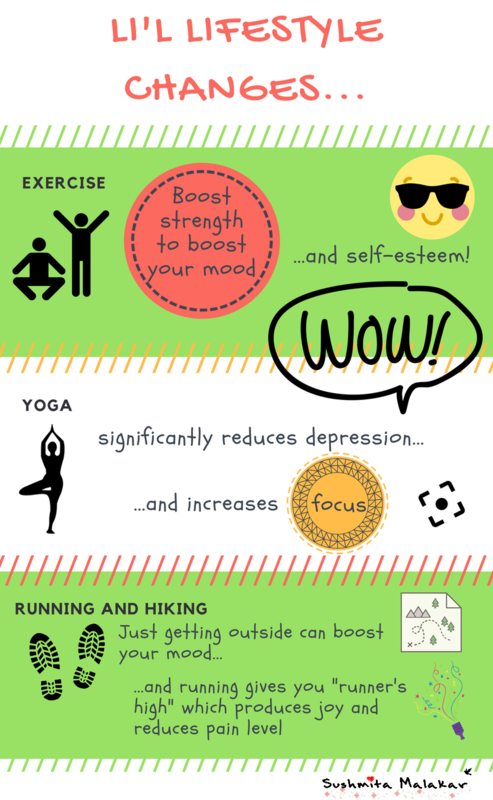 Some li'l changes or addition in your daily lifestyle can actually help you feel more relaxed. And these are factual things I am talking about - at no point in time, I mean that these can be alternatives to going out in person and seeing a doctor. I completely understand that you must have tried to do some of these things and maybe pushed yourself really hard at times. Being there, I understand that it is not an easy task. The struggle is real. And now I will talk about this wonderful app, Thrive, which will help you in a way, even if the help is small! 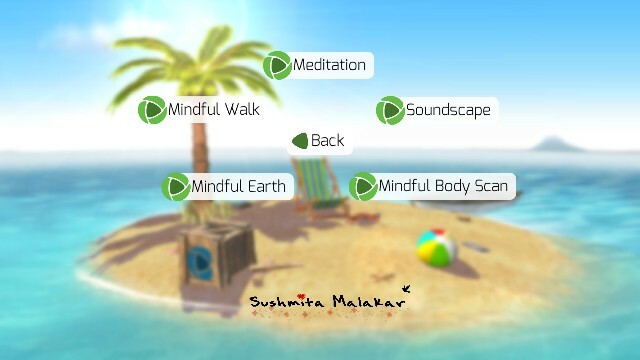 Plug in your headphones, install this app and then you will be in for a ride - ride towards calmness. The first set of evaluation is about your current state. My current state is not very pleasant and aahh, I have finally come to terms with it (you see, talking about it here!). But I at least know that I have to take special care of myself. Trust me, when you get to know about it, it might be disturbing but relaxing in some way. You know you have a problem which has a solution! And then as you dig deep into the app, you come across various things like a mood tracker which over a period of time, helps you feel good each day. There are different exercises too, for which if you take 10 to 15 minutes out of your life, they work wonders in bringing some peace at the end of the day. This has worked well for me and thus, I want to suggest it to people out there, if they are struggling in the same way as me. I have achieved a different level of calmness and come to terms with a lot of things. Having said that, I don't mean that I have become ignorant about my current state - I am just gathering all of it that takes to get up and go out and do something about it. And I am sure I am going to get things in place for myself. I am already on it. That positivity, my friends, is the first step towards feeling right. Every morning I get up, I am not at all motivated to live through the day. And that is an issue to worry about if it is a perpetual feeling. My job is suffering because of it, my blog is suffering and above all, my personal life is suffering too. Living life should be an effortless process, which is not in my case. I know I can do better than what I am doing today at work. If you have been following my posts lately, they lack the emotional connect which they used to have earlier. And I know I am far better than this! That is why I have decided to listen to anyone who tries to reach out in their times of distress. I might not take them out of the sadness but the sense of being heard is priceless and I know it - the hard way! PS: This is a very personal and heartfelt post. If this helped even a single reader, I know my purpose is solved! I hope that your belief of the stigma fading away is a reality! Just talking about it is the first step in the right direction. I feel that the lack of a higher purpose is often the root cause of such phases, especially when people like us, who are among the most privileged in the world, feel like this. There are only a handful of people who connect with a higher purpose and the difference in the way they lead their lives is very visible. Whenever you hit a motivation trough, try to visualize any person who is suffering more than you. Just try to think how much effort has been put in by so many people, the society, the government and nature in order for you to be in your current state of living. Are we entitled to disappoint or disrespect any one of them? I think not. I think we owe our lives to them. We can't cheat them and ourselves. I completely agree about the phases. But somehow, I feel, that issues which require special assistance are not dependent on your present family/professional or financial status. I hope you are getting what I am trying to say. It is more of a personal struggle that we all go through..ummm.may be when we see ourselves nowhere near that higher purpose.. Kudos to you for such an honest post. opening your heart to someone is not easy in any way but you did a commendable job. 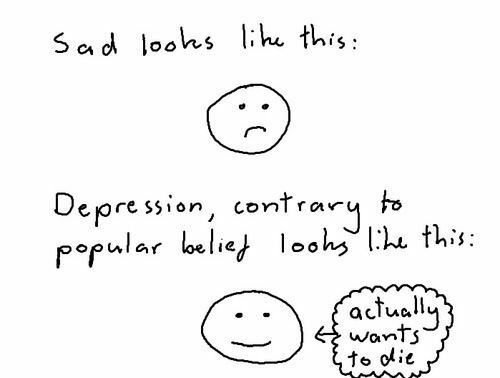 yes depression is dangerous, its like a bottomless well where you find yourself alone. I work in this field so I know how it affects people and there is no one solution but a number of things done together work well.Helping others is one of them. best of luck to you. I am so glad that you stumbled upon this post! I find myself fortunate and strong enough to deal through this. But I just want people to reach out be safe.. Thanks for this. A very relevant post. I know i see myself in a lot of this. And yes, I still remain a hypocrite advocating this while I hardly do it myself. This was one all encompassing post about depression. I loved your graphics that send the message across so effectively. Thanks for sharing this wonderful post. Very nice post. I have been there and exercise help immensely to come out of the darkness of depression. Mental health is usually ignored but should be given primary importance. very well written and exhaustive post. I feel we should certainly be aware of our surroundings and even ourselves. Thanks for teh article. I too believe that it is high time that we become sensitive to things around us. 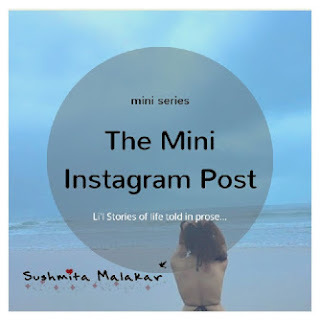 This is such a detailed and thoughtful post sushmita. Great work on the infographics! I know what depression feels like, i also know how it feels to be out of it.. I feel suprised I climbed out of that well, but I am never jumping back in or hope I dont. Sharing this with a friend who I know will appreciate it. What software are you using on the infographics? Canva? Thank you so much! I hope that your friend finds it useful. I loved ur post n found myself in it in numerous points. I am absolutely vocal about mental health and I believe as a nation with the kind of increasing depression rate, we all shud be vocal. Each of the illustrations are really fantastic. 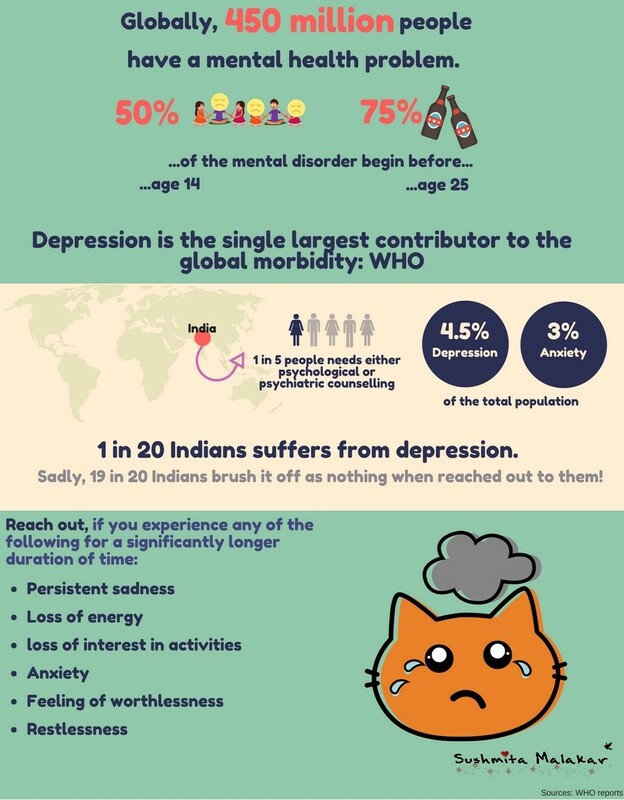 I guess the fact that people brush off mental health in India as nothing is because there is a huge lack of awareness that mental health anxiety can be a huge problem. It is hugely looked down up by almost all and sundry. It's like if you are mentally unhealthy means you are a coward or something of that sort. This kind of mindset makes things hugely difficult in India. Awesome blog you have shared. Here Springfield Wellness Center in Springfield, Louisiana is best mental health clinic.